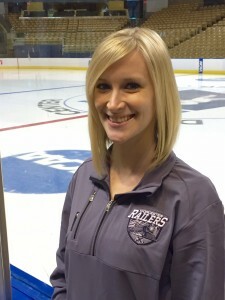 WORCESTER, MA – The Worcester Railers HC welcomed Leah Motsis to their staff on Monday, April 4, 2016. Ms. Motsis, a native to Worcester County and an avid hockey fan, earned her degree at Westfield State College. Upon completing her B.A, she went on to establish her career with the DCU Center- a 14,500 seat Arena in Worcester, MA- in 2009 where she spent three years as the Group Sales Coordinator, followed by three additional years as the Advertising and Sponsorship Sales Manager. Leah comes to the Worcester Railers HC with personalized experience and an overall love of the community and hockey in Worcester. She will be developing and implementing all areas of the Worcester Railers HC corporate sponsor membership program. Interested parties may contact Leah Motsis at leahm@railershc.com.